Having a pet can be one of the many joys of living in a house or an apartment. Although they can be a lot of responsibility to feed and take care of, owning pets can increase your mood and give children a valuable lesson in responsibility. Pets can come in all shapes and sizes, from the common dogs and cats, to smaller animals such as lizards, hamsters and more. For many families across America, having a pet feels just like adding a new family member. However, some pets require more maintenance than others. Whereas lizards, fish and snakes have no hair to be seen, certain kinds of mammals often have quite a lot. 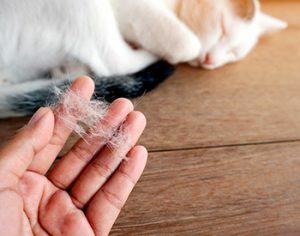 Depending on the animal and season, you might find that there is hair everywhere in your home, from your sofa to your favorite jeans. While a little bit of hair usually isn’t a huge deal for many, a lot can make you feel as though it is impossible to fully handle. This article will inform pet owners of the negative side effects of pet hair, and how they can effectively clean their home if they have it. What kinds of animals produce pet hair? To fully understand the potential issues that could arise due to pet hair, it can be helpful to learn more about the animals that make it. Certain mammals shed, or release some of their dead hair and dander, when their fur grows too long. Some dogs, for instance, are genetically prone to growing their hair to be long and thick during the winter, and then shed during the springtime when the temperatures rise. Other dogs, who live indoors in a controlled environment, might shed a small amount throughout the year, or else none at all. While dogs are perhaps the most famous example of an animal that sheds, others do as well. Lizards and other reptiles do their own version of shedding, known as molting. This is a process where they grow out of their old skin, and thus shed it off in one swift process, revealing new, roomier skin in its place. Besides dogs, most other hairy animals happen to shed, as well. Between cats, ferrets, hamsters and more, nearly all domesticated pets do some form of shedding, although the amount of hair can vary. What can be the problems with having pet hair in the home? Trigger someone’s allergies. Many people are allergic to pet hair and dander, which can be a very frustrating problem to have. Being too close to it can cause some to become congested, others to swell up, and even others to break out into rashes. Even if you and your family are not allergic, it can be polite to clean your clothes of it before meeting with people that you don’t know. Get all over your important clothes. Most pet owners do not mind when they have a little bit of pet hair on their clothes. However, when you are trying to dress up for an important occasion or get your picture taken, obvious pet hair can look distracting. Get into places and things where it shouldn’t be. Hair is a small and lightweight material, so it is very easy for it to get everywhere without too much assistance. This includes places like your kitchen, which can be a problem if you are preparing food. Nobody likes to find a hair in their food, and the likelihood of that for pet owners is much higher than normal. If there is already a lot of pet hair in your home or on your clothing that you want to remove, there are luckily plenty of options for you to consider. Because this hair can get everywhere, getting your house completely free of it can sometimes seem like an uphill battle that never ends. But, by using the right tools, you can get your home just as clean as it was before a pet lived in it. The first method that you might choose is to use some kind of lint roller, or a similar special device built for pet hair. While traditional lint rollers work fine, they can often be expensive as they are not reusable. Many products exist on the market that allow you to reuse your hair cleaning tools. Some appear to be brushes, others appear to be brooms, and others still come in the form of special gloves. Nearly all of these products work as advertised, but they can be expensive. For a cheaper solution, try to use some normal rubber gloves. They will often use static to cling the hair to them, and work just as well. On the other hand, you could go for the vacuuming route. There are many special vacuum cleaners that are designed to grab pet hair from carpets and fabrics, but you may also wish to get an industrial cleaner with a long, extendable tube attachment that can reach corners and other difficult places. Even items as simple as wet-release brooms can be effective, as long as they are used on the appropriate hardwood flooring. Brushing your pet thoroughly and often. By using quality brushes that take good care of your pet on a regular basis, you can get a surprising amount of hair off of them before or after giving them a bath. Staying on top of this process can limit the amount of hair that they shed dramatically. Using an air purifier. While they do not always work with 100 percent accuracy, running an air purifier can help to limit the amount of small hairs and dander flakes floating in the air. This can also be a great tool for pet owners who have a minor pet allergy. Investing in a fitted fabric jumper for your pet. While it may look silly, giving your dog or cat a specially fitted suit can prevent their hair and dander from being released into the open air and onto furniture. This can be especially useful when taking your pet to another person’s house, or into the car. Dealing with pet hair can seem like a nuisance, but it is simply a price that many of us are okay with paying in return for the love and companionship of our furry friends.